Imperial shag or blue-eyed shag, in tussock grass. 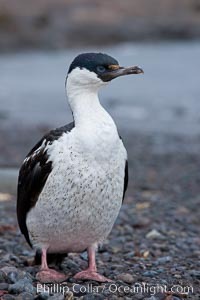 The Imperial Shag is about 30" long and 4-8 lbs, with males averaging larger than females. It can dive as deep as 80' while foraging for small benthic fish, crustaceans, polychaetes, gastropods and octopuses. 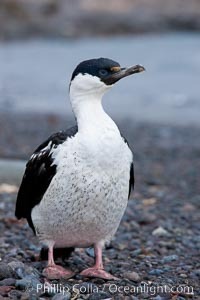 Imperial shag, Phalacrocorax atriceps Picture. 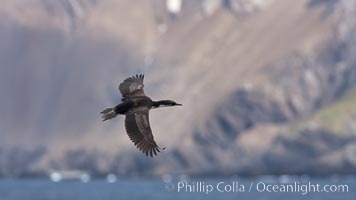 South Georgia shag, or Imperial shag, a type of cormorant, in flight alongside South Georgia Island. Stock Photography of Imperial shag, Phalacrocorax atriceps. 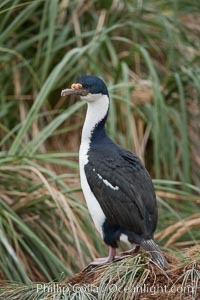 Imperial shag, or blue-eyed shag. 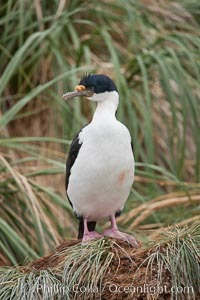 Photograph of Imperial shag, Phalacrocorax atriceps. Imperial shag, or blue-eyed shag. Imperial shag, Phalacrocorax atriceps Photos. 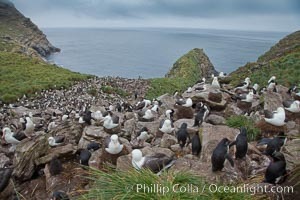 Colony of nesting black-browed albatross, rockhopper penguins and Imperial shags, set high above the ocean on tussock grass-covered seacliffs. Imperial shag, Phalacrocorax atriceps Image. 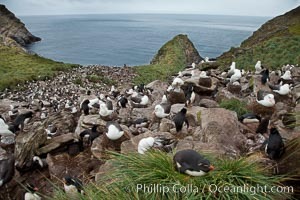 Colony of nesting black-browed albatross, rockhopper penguins and Imperial shags, set high above the ocean on tussock grass-covered seacliffs. Professional stock photos of Imperial shag, Phalacrocorax atriceps. 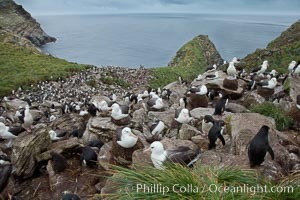 Colony of nesting black-browed albatross, rockhopper penguins and Imperial shags, set high above the ocean on tussock grass-covered seacliffs. Pictures of Imperial shag, Phalacrocorax atriceps.